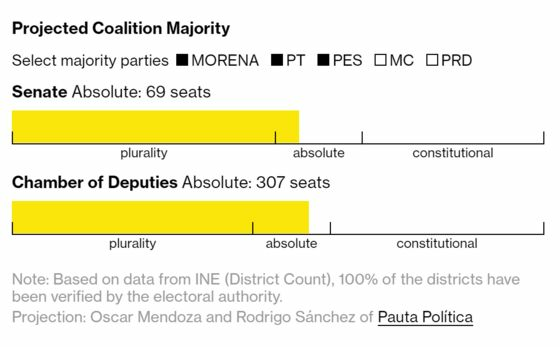 (Bloomberg) -- Mexico’s incoming president, Andres Manuel Lopez Obrador, is so close to reaching a constitutional majority in both houses of congress that it’s become a pastime of analysts’ to calculate how he’ll get there. His coalition will have 307 lower house seats and 69 in the Senate, according to one projection from the final tally. That leaves him short 27 deputies and 17 senators to reach the two-thirds majority needed to reform the constitution. Lopez Obrador swept the general elections last week, not only winning the presidency by a landslide and absolute majorities in both houses, but taking at least 17 local legislatures that are needed to pass constitutional reforms. AMLO, as he’s called, has said one of the first things he’ll do is repeal a landmark education reform that requires teacher testing and replace it with less onerous measures. He’ll be able to do that easily by drawing from other left-leaning parties, analysts say. If he wants to, he could even roll back the nation’s energy reform that opened the industry to private drilling, according to experts from Washington-based Eurasia Group and Mexican consultancy Pauta Politica. "Modifying all of the structural reforms are within his reach," said Oscar Mendoza, an analyst with Pauta Politica, referring to the major economic overhauls that outgoing President Enrique Pena Nieto achieved in his term. His Morena party-led coalition could bring the left-leaning Democratic Revolution Party and Citizens’ Movement party on board, and would only be short three senators from getting the constitutional vote, says Mendoza. Then all he’d need would be a few absent senators to make up the shortfall. The two-thirds count only includes lawmakers present at the vote. But both Mendoza and Eurasia Group say it’s not likely the incoming president will completely undo the energy reform, as he understands it would hurt investor confidence. His future chief of staff, Alfonso Romo, told Bloomberg News last week that the reform is set to stay. Eurasia Group, however, sees risks he’ll try and change aspects of the reform, such as the independent regulator, which would make operations more vulnerable. "The risks of more meaningful changes early on in the Lopez Obrador administration should not be underestimated," Eurasia Group states in a note to clients.